The NCT/UCC Steering Committee Dresden consists of seven voting members. 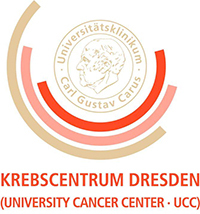 The German Cancer Research Center (DKFZ) is represented by its management board, the University Hospital Carl Gustav Carus Dresden by its medical and administrative directors, the TU Dresden by the dean of the Medical Faculty, and the Helmholtz-Zentrum Dresden-Rossendorf by its scientific and administrative directors. The NCT/UCC Steering Committee Dresden supervises the NCT/UCC Managing Directorate and defines important strategic, staff-related and financial matters of the cooperation as well as the direction of the NCT/UCC. The NCT/UCC Managing Directorate participates in the meetings of the NCT/UCC Steering Committee in an advisory capacity. The members of the local NCT Steering Committees Heidelberg and Dresden work closely together with the NCT Directorates of both sites in a superordinate committee: the Joint NCT Steering Committee. It is responsible for the cross-locational cooperation as well as for decisions concerning the NCT as a whole.